As citizens of the United States, we rely on the U.S. military to respond to conflict abroad, protect the home front, and create our sense of personal safety and security – that we often may take for granted – in our everyday lives. Unfortunately, however, during their military careers, many members of the armed forces are unable to keep themselves safe. In fact, they often suffer from a host of physical, mental, or emotional issues ― sometimes all three at once. Transitioning from military to civilian life can prove challenging. And, if left untreated, the overwhelming weight of the soldier’s military experiences can have catastrophic consequences. Military social workers help former soldiers, not only during the transition period, but in any capacity necessary over the course of the soldier’s life. They assist, not only soldiers and officers on active duty, but veterans as well. Additionally, they support the soldier’s family members with the challenges of everyday life in the U.S. armed forces. A social worker’s primary role is to serve as an advocate for members of the military and their families. They ensure that they and their families have access to the care, services, and support systems necessary to remain physically secure and emotionally healthy ― during their military careers ― and for the rest of their lives. Overview of Social Workers in the Military: What Is Military Social Work? The plight of soldiers returning from wars in Afghanistan and Iraq over the last two decades, as well as the needs of veterans of previous wars, has underscored the urgent necessity for social workers in this role. Members of the armed forces require considerable assistance, not only during active duty, but for years afterward as they grow into old age. The military social worker professional must understand the unique vicissitudes and circumstances of those in military careers and serve as a broker, connecting them with the appropriate programs, services, and counseling to help them adjust to everyday life, first in active duty, and later, as a civilian. Military families also experience challenges, including financial stress, emotional disturbances caused by continual waiting for their loved one’s safe return, military school attendance, and the frequent moves required of active service members. Social workers assist in both a macro- and micro-capacity, providing services to individual family members as well as scheduling and coordinating programs for entire populations of service people. Military social work encompasses a range of sub-fields. Social workers must understand and have knowledge of psychology, medicine, military and ethnic cultures, diversity, finances, educational approaches, military structure, military branches, active duty versus veterans’ challenges, ethics, and more. Military social work, a specialized field of practice spanning the micro–macro continuum, requires advanced social work skills. The complex behavioral health problems and service needs of Iraq, Afghanistan, and other war veterans emphasize the necessity for highly trained social work professionals to provide relevant, responsive services. What Does a Military Social Worker Do? A military social worker coordinates services and direct care to address the needs of deployed and retired service members, military staff, and families. The social worker is trained to address challenges in a holistic manner rather than individually. While doing so, the social worker seeks the best solutions for the hardships and hazards ― mental, emotional, and physical ― that confront military members at both the individual and community levels. Social workers help military personnel cope with a wide range of disabilities, physical ailments, mental health disorders, and psychological difficulties that result from combat and military life. In addition to dealing with trauma and distress, military social workers understand and implement protective measures and interventions to help mitigate the negative outcomes from serving in the armed forces. Social workers also attempt to ease the transition from active duty to desk work to civilian life, all the way to retirement. Social workers must understand the unique consequences of military life for family members, such as living with someone suffering from PTSD or a mental health disorder. The family may have to cope with substance abuse, physical abuse, or threats of suicide. The military social worker must also understand how the emotional stress of life in a military family can create its own type of trauma, even for those never exposed to combat. 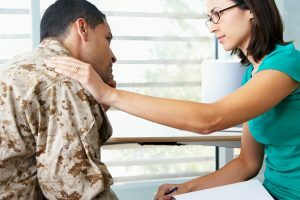 Military social workers find employment in a range of settings, including the combat field, military hospitals, military bases, veterans’ hospitals and care centers, and counseling centers. Many see clients on a regular basis, working with individuals to coordinate their needs. Others work with fewer clients or sometimes none at all; instead, they take a macroscopic approach to the needs of an entire military base or other military community. A social worker’s environment often is filled with other professionals with whom they make joint plans to benefit their clients. Those responsible for making decisions for a larger audience usually require the input of many other professionals. As a result, psychologists, doctors, officers, and other social workers may influence how a social worker approaches a particular case or problem. A military social worker faces significant professional challenges. Firstly, social workers in this field frequently encounter traumatized soldiers, grief-stricken family members, maladjusted children and spouses, and other individuals coping with difficult situations. The military social worker must avoid internalizing these negative emotions; doing so can make the job draining, frustrating, anxiety-inducing, and stressful. Military social workers also must maintain a more specific knowledge base and skill set than many other social workers, because their clients require highly specialized services. The job’s tight focus makes it easier in many ways, but it also means to gain employment, a would-be military social worker requires a deep level of specialized training. Military social workers’ long hours also can prove challenging. A day filled with multiple crises is common. Clients with PTSD may abuse substances, experience mental breakdowns, attempt suicide, and more. They also may experience extreme difficulties in meeting their financial needs or adjusting to frequent deployments or moves. Additionally, the client may have family members with special needs. Social workers in this crisis-filled environment must be prepared to respond quickly, often during evenings and over weekends. The current salary for social workers is $22.54 per hour, or roughly $47,000 a year. Military social workers are in high demand because of the aging of the baby boomer cohort that served in foreign wars and the combat troops coming back from the Middle East. As a result, the field is growing rapidly. Generic social work jobs are predicted to grow at a rate of 12 percent between the years 2014 and 2024. However, military social work as a career is growing faster. Although exact figures are difficult to determine, those who graduate with a degree in social work and a military specialization will readily find employment. A military social worker may be hired by any branch of the military or other government body that works closely with the armed forces, such as the U.S. Department of Veterans Affairs. They may also work within more specific programs, such as with housing or food assistance, catering specifically to military personnel or their families. To become a military social worker, students are required to earn a master’s degree. In some cases, the student may opt to study for a Ph.D. if he or she wishes to work in an administrative role. In other, rarer cases, a bachelor’s degree may be enough to enable graduates to find employment in the social work field, but they cannot establish their own practice. In many instances, those who hold master’s degrees may opt to become commissioned officers in the military branch in which they work. To obtain employment as a military social worker, students must first earn a bachelor’s degree, followed by graduation from a master’s program. All social workers, whether civilian or military, must earn their license by completing both a specific number of academic hours and supervised clinical hours, then sitting the licensing exam. The exact nature of this exam varies by state and jurisdiction. Training is an ongoing process, including consultation with experts, continuing education, and acquiring experience in the field. With enough experience, a military social worker can advance in rank in their branch of the military. While certification is not, at any point, required by law, it may be required for certain employment positions. A more specific focus in certain areas helps career advancement and brings leadership opportunities. Learn more about social work licence requirements.